It was in the land of blackened sands and mango trees, atop a tree in a jungalow in the midst of the resounding sounds of howling monkeys, that we first fell in love. Costa Rica had served as the backdrop to the beginning of our journey. We had met one another there two years before, Jesse being from Baltimore and I from Kentucky. Somehow we had found each other in an exotic land of endless possibilities. It was only fitting that for our honeymoon, the celebration of our union, we would travel once again to Costa Rica to rediscover one another and the love of all things adventure that had brought us together. We chose a honeymoon registry because we had lived together for over a year and since we had combined two houses, we were in no need of the traditional wedding gifts. I discovered Traveler’s Joy after researching different sites, and it seemed to be the best and easiest to use. When we travel we usually wing it, and though I love just going where the air takes me, I wanted to somewhat plan our honeymoon. The registry worked really well and from the total amount that we received, it almost covered all of our expenses except for the flight, which was not that expensive. In all, we managed a wonderful ten-day trip for just under $1,500.00, which for us is quite amazing considering the circumstances that awaited us upon arrival. After finding amazing prices on flights from Expedia, we began to plan our trip. 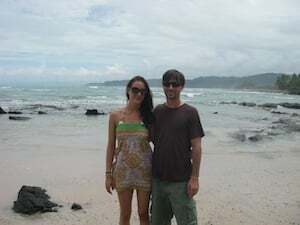 Neither of us had travelled the southern region of Costa Rica, the Oso Peninsula, and since it was considered the most ecologically diverse region in the world, we were both tremendously excited to travel there together. The seclusion was appealing, the idea of being practically cut off from the rest of the world among the ranging mountains of forests and with one another seemed the most romantic destination. The plan was to arrive on July 13 in San Jose and travel south, visiting the National Park of Manuel Antonio and the small towns of Quepos and Dominical, all while traveling toward our final destination, the Oso Peninsula. We would spend the majority of our time among the wilderness of the Puntarenas Region and travel back to San Jose for our flight on July 23. We arrived in San Jose on a rainy afternoon and were immediately grateful that our rental company, Budget, had met us at the airport to take us to our Jimney. After settling the logistics of car rentals and promising we would not cross any raging rivers while traveling during the wet season, we loaded our blue Jimney, a two-door hatchback, with our two suitcases and Jesse’s folding fishing pole. With a map in my hand and visions of greatness in our eyes, we started off toward the town of Quepos. Usually, I am a budget traveler, taking full advantage of hostels and couch surfing. However, this was our honeymoon and we decided to splurge on the first two nights of our trip and stay in a beautiful resort, Issimo Suites. After navigating our way out of San Jose traffic and down the small highways that curved along mountains and through valleys, we arrived in Quepos just before dark. I can honestly say I have never stayed anywhere so nice. The staff greeted us with such sincere enthusiasm and graciousness that I truly was touched by their generosity. We had reserved a Junior Suite, but upon our arrival and having heard it was our honeymoon, they upgraded us to their nicest suite, The Penthouse. The room was amazing. I had never seen anything like it. A panoramic glass wall offered breathtaking views of the crystal blue ocean, crescent bay, jungle and distant mountains. A pristine beach lay just below the endless grove of trees that poured down the side of the mountain and the changing horizon offered a pallet of golden peach colors. We settled for the evening with a nice dinner on the balcony of the resort and then retired for some rest and relaxation. The next day we wandered the beaches and climbed over the jutting shore, we settled for poolside drinks in the afternoon since we knew this was going to be the only time we stayed in a resort, and in the evening we once again dined overlooking the magnificent Pacific. The next morning was to be the morning we went zip lining. 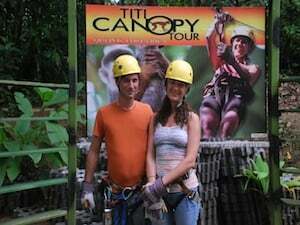 I had always wanted to go, even with my fear of heights, and Jesse was on board for anything that would allow us to see the jungle. The receptionist at the front desk made the arrangements and we were picked up by a small van carrying a number of other tourists. Once we arrived at the venue, we strapped ourselves in to our harnesses and began the mile long hike up the side of the mountain. My hands were trembling the entire time and I was trying desperately to hold back the tears that I was sure wanted to pour out of me. I knew that I was not going to be able to do this and yet, there was no way that I would be able to turn around. Jesse grabbed my hand as we hiked, sensing my trepidation, and offered a supportive smile. As we neared the first platform and the others went, Jesse waited behind me as I prepared to sail out among the treetops. There are not words to explain how terrified I was, but I knew that I couldn’t turn back. I closed my eyes, exhaled, and jumped off, sailing across the jungle floor between trees and hanging branches for what seemed like an eternity. It was exhilarating. When I finally landed on the next platform, my adrenaline was pumping and though still terrified, I was completely in love with zip-lines. After we crossed about seven lines, one being a thousand feet long, we headed back to our room to clean up and check out. We said our good-byes to Quepos and our beautiful resort, preparing for a week in the rainforest where there would be no email or phone, no electricity except at night and enough nature to last us for the rest of our lives. Little did we know that as we had planned this marvelous adventure among the exotic of the Puntarenas Region, God had began laughing. Our drive down the west coast of Costa Rica started off great. We were making good time even when the rain began and the roads became curvier and full of potholes. Jesse had read that we might have to cross rivers and that there weren’t many bridges, but nonetheless we were prepared to do about anything to get to the rain forest. The drive had taken about four hours when it started pouring down – and I do mean pouring. The roads became worse, narrow and muddy with the occasional paved section that was deteriorating under the pressure of our tires. None of this bothered either of us much; we were fine taking our time. We arrived at a small bridge that was divided by long gaping sections where boards used to be. However, we crossed it with relative ease due to my husband’s wonderful ability to maneuver in the midst of failed structures and continued our way. We came to a river, crossed it, another river, crossed it, and yet another and crossed it. I was laughing because of fear that we would be swept away. After driving for another four hours at 25 mph, we reached a river that was a bit too big for comfort. Theoretically we could cross it, the problem came when we realized that we were now in the heart of the Oso Peninsula, the wettest part of the country even in the dry season, and this was the wet season. It was not going to stop raining, the rivers would rise even more over the next week, and if we crossed there was a very likely chance that we would not be able to cross it on our way out. We would be stuck until November. After driving a total of nine hours to our destination, we reluctantly turned our little Jimney around and headed north. Now, our entire honeymoon was up in the air. Not that we mind spontaneity, but we were a little disappointed that we wouldn’t get to see the rain forest as we had planned. We had driven so long just to turn around that we decided to stop in Dominical on our way north instead of waiting until the end of our trip. We arrived late and found a room at a small hotel on the beach. It was a nice room for a good price and though it was not where we originally planned to stay, it was comfortable and we enjoyed each other’s company over dinner and drinks overlooking the ocean. The next morning we headed to the Nicoya Peninsula. The last time we were in Costa Rica we had remained in that region the majority of the time and had enjoyed ourselves immensely. We drove north and hopped a ferry over the Nicoya Gulf. It was a wonderful break from driving. There was a DJ on the ferry and swarms of people dancing, having a great time underneath the sunlight that seemed to only come out as we left the mainland. The energy on the ferry was contagious and though we had taken a bit of a detour from our original plans, we were happy to be together and listening to Costa Rican music while we ate lunch over the gulf. The clouds had cleared and the scent of salt and empanadas swarmed around us. It was delightful. After a two-hour ride, we arrived on the Nicoya Peninsula in a little town of Paquera. We were destined for Montezuma, a small beach town at southern tip of the peninsula where we had spent much of our time on our previous trip. It was only a couple of hours away and so we set off down the winding road of memories that had led us to this land in the first place. 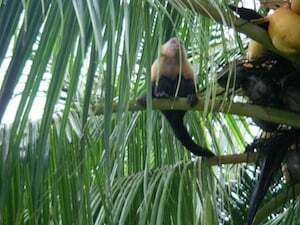 As we drove along the mountains, howler monkeys became more and more abundant, jumping from one branch to the other over power lines, grunting with each landing in complete satisfaction. When we pulled in to Montezuma, we embraced the familiarity of the small town. The central road that led down to the tavern and the public beach, the pizza parlor that offered mayonnaise with every pizza, and the random stands of homemade jewelry and home décor. After such a long drive, it was as though we had come home. We found a room at Lulu Inn, the same Inn we stayed before. It was a small building that sat so close to the beach that when the windows were open we were misted by the rising waves. It was like we had gone back in time, except now we were married. Now we knew we would be together for the rest of our lives. The weather was nice and we hiked down the beach a ways until we found a secluded place. Jesse fished and I wrote, taking in the novelty of this place in a whole new lens. The last time I had been on that beach he had been a stranger, this time he was my husband. That evening we found our way to the local tavern for dancing, cards, and drinks. We strolled along the darkened shore, over the rocks, and under the stars until we came upon the waterfall that we had discovered a couple of years before. We sat with our bottle of wine and played a “how well do you know me” game that he reluctantly took part in and I won. The next morning we dined at a small hut down the road. I have no idea the name, but an old woman owned it and made the best Costa Rican breakfast in all of Costa Rica. The meal consisted of eggs, beans, plantains, and coffee that would knock the socks off even the burliest of men. As we sat and drank our coffee, we were visited by a number of Spider Monkeys that would hand their heads over the edge of the awning and squeak shrill sounds of humor to one another. Then out of nowhere one jumped from the rafters onto an empty table, grabbed the glass holder of sugars, pepper, and salt, and flew up the side of tree. He perched himself on a branch, threw the glass container to the ground and shrieked as it shattered. One by one he opened the small packages of salt and tasted them, screeching from the taste and tossed them to the floor. The sugar, however, remained in his hands and he swallowed them down, jumping up and down as he finished each one. The most glorious part was when a mother with her baby perched on her back came and he offered her sugar. It was one of those moments when you realize the glory of the animal kingdom. The best part was when the old woman came out with a broom and tried to sweep them away to no avail. It was hilarious and lovely, all the things we wanted in our honeymoon. 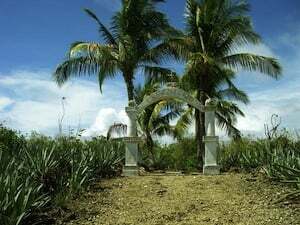 We had heard about an island with an old graveyard the last time we were in Montezuma, but had never been able to reach it. The only way across was to walk when the tide was low and we had never managed to catch the tide at the right time. This trip we were going to. We set out down the beach, snorkeling gear and camera in hand, and waited for the tide. As it lowered, we began to walk across and finally made it just as the tide was rising again. We spent the day discovering the island, snorkeling around the reef, and looking among the ancient graves. At dusk the tide lowered again and we set off for home. After reading from our travel book, we discovered that we were just on the other side of the peninsula from what was considered the most beautiful beach in Costa Rica. Since we were only staying night by night at our Inn, we packed our things and set out for Mal Pais. The road there was scary, through the mountains of jungle over crooked roads that were so covered in mud that we slid a few times whenever we have to curve around the bends. Upon arrival we found a beautiful resort and since we had budgeted the past three nights, we decided to splurge for the remainder of our time in Costa Rica. The Moana Lodge was amazing. They had a restaurant that over looked the entire Pacific Ocean, swinging lounges, and rooms that were immaculately decorated. The staff was so generous and willing to help with anything. We were very lucky to have found it. After checking in we went for a hike near the Cabo Blanco National Forest around the beaches next to the clearest waters we had seen yet. We hiked for hours, taking in the sights, and resting along the way against the sounds of the jungle and crashing waves. For dinner we ate in the restaurant against the setting sun, and then went swimming in the pool until we retired. The next three days were full of snorkeling, surfing (which I did not do well), and relaxing. The beaches in Mal Pais are white sand and absolutely beautiful. They make one believe in magic, in mysticism. It was the best three days of the whole trip, and it gave us the honeymoon we wished for even though we had to make quite a detour in the beginning. The day before our flight, we left Mal Pais with great dismay. We wanted to stay longer, to remain in the land of tropic bliss. As we drove to the ferry and boarded, I thought of how things had changed since the last time I left the peninsula, of how when I left, I had left in love yet knew not if I would ever see the man again. This time, I left with the man by my side, hand in hand, to begin our life together and continue on with our random adventures of humorous circumstance. We would recommend that kind of honeymoon to anyone.